The Wizard of Oz is a classic tale about dreams, home, and family. Adaptations–and especially those based on the classic 1939 movie starring Judy Garland–have been staged in various places around the world for decades. It’s a very popular show, especially for family audiences. It’s an ideal selection for Variety Children’s Theatre, with its huge casts of adults and children, featuring director and choreographer Lara Teeter’s inventive staging and excellent opportunities for the child performers especially, making for an entertaining and vibrant show that’s definitely a crowd-pleaser. Variety Children’s Theatre is now in its ninth year, producing shows in association with Variety the Children’s Charity, which works with children with special needs. The shows allow the Variety kids the opportunity to participate in a full-scale production either on stage or behind the scenes, along with more local children and professional actors and crew. The Wizard of Oz is the first Variety show I’ve seen, although I had heard great things about their productions in the past. Overall, this is an impressive production, utilizing the space at UMSL’s Touhill Performing Arts Center with a great deal of energy and creativity. It’s the Wizard of Oz. It’s so well known that I don’t think I really need to summarize the plot. It’s a beloved classic, but it’s one that’s been done so many times that it can get to the point where it doesn’t seem like anything new can be done with it. This production proves that the show can be performed as written, but with still finding new and fresh approaches to the staging and characterization. I’m usually impressed when a production casts a Dorothy who doesn’t try to sound like Judy Garland, and this production does that well with the excellent Elizabeth Teeter, but it goes even further, with a characterization of the Wicked Witch of the West (Allison Newman) that is truly novel, as far as I’ve seen. The rest of the familiar characters are all here–Aunt Em (Laurie McConnell), Uncle Henry (Rich Pisarkiewicz), the Scarecrow (Drew Humphrey), Tin Man (Martin Fox), and Cowardly Lion (Patrick Blindauer), as well as Glinda (Julie Tabash Kelsheimer), the Wizard himself (Alan Knoll) and, of course, Toto (Nessa). The story is the usual story, but what’s most notable here is the inventive staging, including excellent flying effects and the excellent utilization of the adult and children’s ensembles. The production values are excellent, from Dunsi Dai’s colorful, versatile set that relies a lot on movable set pieces, to John Wylie’s dazzling lighting, to the well-suited costumes by Robert Fletcher and Kansas City Costume. The flying effects, from Flying by Foy, are among the most impressive I’ve seen in a St. Louis production, as various characters and set pieces “fly” with seeming effortlessness. The staging is especially strong as well, particularly in the ensemble numbers which provide excellent moments for the child performers, especially in Munchkinland, and for the adult ensemble in the Emerald City sequences and in the Witch’s castle. Teeter’s energetic choreography is also a highlight, from the various solos for the Lion, Tin Man, and Scarecrow, to the spectacular “Jitterbug” sequence. Teeter is especially adept at incorporating all the cast members into the production numbers in inventive ways. There’s a great cast here, from the earnest, strong-voiced Elizabeth Teeter as Dorothy to Newman’s truly hilarious, interpretation of the Wicked Witch. She’s younger, and kind of whiny, spoiled and entitled. I’ve never seen the Witch played that way before, but here it works, and Newman does a good job of being funny and menacing at turns. There are also winning performances from the scene-stealing Blindauer as the Lion and as Kansas farmhand Zeke; the flexible Humphrey as the Scarecrow and farmhand Hunk; and from Fox as the amiable Tin Man and farmhand Hickory. Pisarkiewicz is also impressive as Uncle Henry and especially as the Emerald City guard, and McConnell turns in a solid performance as Aunt Em. Knoll, as the Wizard and as Professor Marvel in the Kansas scenes, is also in good form, and there’s an excellent canine performance from Nessa as Toto. The children’s ensemble is excellent, as well, with notable performances from Nick George as the Mayor of Munchkinland and Charlie Mathis as the Munchkin Coroner. The adult ensemble features excellent performances from all, and especially Will Bonfiglio, Nathaniel Hirst, Mitchell Holsclaw, and Caleb Long as the Apple Trees. Everyone does a great job, though, from the Munchkins to the Winkies to the Flying Monkeys and more. I’m glad I was able to see this performance. It’s a huge production, with a huge cast, and as is fitting for The Wizard of Oz, a lot of heart, brains, and courage. This is a thoroughly entertaining show, and I’m looking forward to seeing what Variety Children’s Theatre will present in the future. It’s June in St. Louis, and that means it’s time for the Muny again. It’s the 98th season for the illustrious venue, and first on the schedule this year is one of its most popular shows, The Wizard of Oz. Based largely on the classic 1939 film version of L. Frank Baum’s story, the Muny’s latest production is a crowd-pleasing production with all the expected elements. Directed by Muny veteran John Tartaglia and featuring a well-selected cast and the Muny’s Youth Ensemble, it’s a big production that fills the large stage well. I probably don’t need to explain the plot. It’s The Wizard of Oz, one of the best-known stories in American culture, and well-known around the world. Most people associate the story with the Judy Garland film, and the Muny’s production, with the exception of a few added musical and dance sequences, is essentially the film on stage. The familiar characters are all here, including Kansas farm girl Dorothy (Danielle Bowen) and her little dog Toto (Dusty, who is a scene-stealer), who lives on a farm with her Aunt Em (Lynn Humphrey) and Uncle Henry (Rich Pisarkiewicz). Then, there’s the tornado which takes Dorothy and Toto to the land of Oz, where they are sent by Glinda the Good Witch (Leah Berry) to meet the Wizard of Oz (PJ Benjamin) in hopes of returning home to Kansas. Of course she meets the Scarecrow (Kevin Cahoon), Tin Man (Nicholas Rodriguez), and Cowardly Lion (Stephen Wallem), who join her on her quest while they all seek to avoid the Wicked Witch of the West (Peggy Roeder), who covets the precious Ruby Slippers that Dorothy wears. Everything is here, from the famous songs to the Yellow Brick Road to the Emerald City, and the familiar theme that “there’s no place like home”. This is an entertaining production, with a good cast, from Bowen’s Garland-esque Dorothy to Roeder’s more comically villainous interpretation of the Wicked Witch and Benjamin’s charming humbug of a Wizard. Dorothy’s trio of friends are also well-played, with Wallem’s particularly energetic rendition of the Lion being the real standout. Berry is also fine as Glinda, and Humphrey and Pisarkiewicz are a suitably kind and caring Aunt Em and Uncle Henry. There’s also an excellent ensemble, especially in the dance sequences representing the cyclone, and the Poppies sequence, and in the Munchkinland and Emerald City scenes. A song that was cut from the film, “The Jitterbug”, is the real musical highlight, performed with energy and style by Bowen, Cahoon, Rodriguez, Wallem, and company, dynamically choreographed by Ralph Perkins. This is a colorful production, utilizing the film-inspired convention of presenting the Kansas sequences in sepia tones and then going to a full spectrum of colors once Dorothy arrives in Oz. Robert Mark Morgan’s versatile set and Leon Dobkowski’s detailed costumes are all suitably colorful. There’s also strikingly effective lighting by John Lasiter, and good use of video designed by Nathan W. Scheur. The microphones, particularly for the Scarecrow, were inconsistent and sometimes produced a hollow, distant sound, but otherwise the technical aspects of this production work well. Magic and wonder are what theatregoers expect with this show, and for the most part, this production gives them that. The Wizard of Oz at the Muny is just what audiences would expect, and it’s sure to be a crowd-pleaser. While it is essentially a staged production of the film for the most part, the performers are well-cast, the songs are well-sung, the the familiar story is well-told. While I personally tend to prefer productions that aren’t quite as close reproductions of the film, this is certainly entertaining and it’s a fun season opener. I’m looking forward to seeing what else the Muny has in store this summer. 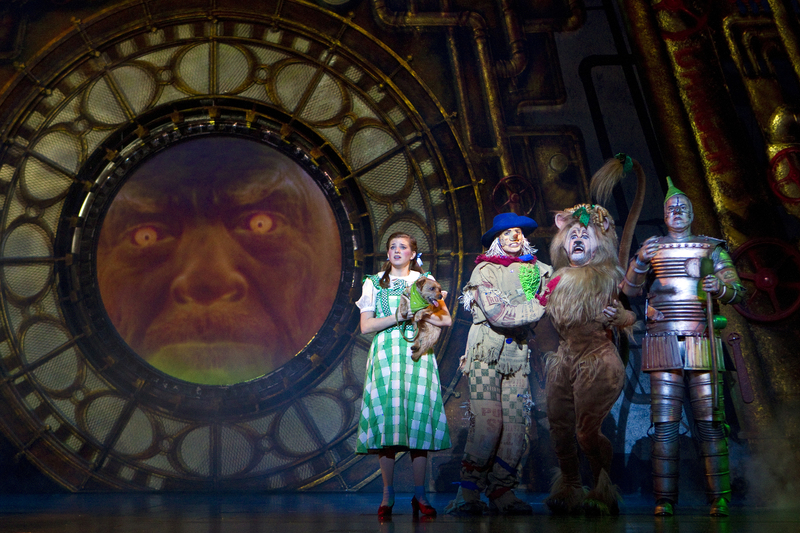 The Muny’s production of The Wizard of Oz runs until June 22, 2016. The real “wizard” behind the curtain of this latest production of The Wizard of Oz is Andrew Lloyd Webber. Having produced this show first in London and then in Toronto, casting the lead via a reality talent competition both times, Lloyd Webber has put his own stamp on the time-honored classic, re-teaming with lyricist Tim Rice to write additional songs for the show and assembling an excellent design team to create a unique look for the production. The current US Tour of the production, starring most of the Toronto cast, has now arrived at the Fox Theatre, and while the overall production isn’t quite as grand as it was in London, it still provides for a tuneful, colorful and entertaining evening of theatre suitable for all ages. The story here is familiar to basically everyone, having been taken mostly from the classic MGM film. Dorothy Gale (Danielle Wade) and her dog Toto (an adorable Cairn terrier named Nigel) are whisked away by a cyclone to the magical land of Oz, where Dorothy, advised by Glinda the Good Witch of the North (Robin Evan Willis), heads off on a journey to the Emerald City to meet the Wizard (Jay Brazeau) in the hope that he will be able to help her get back to her home in Kansas. Along the way, she meets the Scarecrow (Jamie McKnight), the Tin Man (Mike Jackson) and the Cowardly Lion (Lee MacDougall), all the while being antagonized by the vengeful Wicked Witch of the West (Jacquelyn Piro Donovan), who is determined to capture Dorothy in order to obtain the precious Ruby Slippers, with which Dorothy has been entrusted. It’s a classic tale of friendship, bravery and the importance of home, and all those familiar elements are here, with a few mostly stylistic elements from L. Frank Baum’s original book (such as the Munchkins all dressed in blue) thrown in for good measure. I was fortunate enough to have been able to see the original London production of this show three years ago, and I found it spectacularly staged and extremely well-cast. This production has obviously been scaled down for touring, and for the most part, it still looks good, with colorful sets and costumes by Robert Jones, and strong choreography by Arlene Phillips. It’s probably not fair to compare too much, and most of the people seeing this show will not have seen it in London, but I can’t help but wish this version still had some of the scale of the original. Where the scaling down shows the most is in the lack of flying effects (the Witches mostly just walk everywhere, and the Monkeys don’t really fly), and in the Munchkinland scene, where the staging comes across as cluttered and cramped. Also, several of the backdrops have a one dimensional quality, and when Dorothy and friends on the Yellow Brick Road finally see the Emerald City in the distance, it looks a lot like a flat Christmas tree. Still, even with those issues, the show manages to entertain. The Kansas scenes look great here, and I’m also especially impressed by some of the dancing that I don’t remember from the London show, such as an impressive rhythmic baton-clicking dance by the Winkies (the Wicked Witch’s minions) near the end of the show. In terms of the cast, this production does well. Wade makes an engaging, likable, slightly tomboyish Dorothy, and her voice is strong on the iconic “Over the Rainbow”. Despite seeming oddly out of breath through much of the first act, Wade displays a strong bond with her three companions and, especially, with Toto. 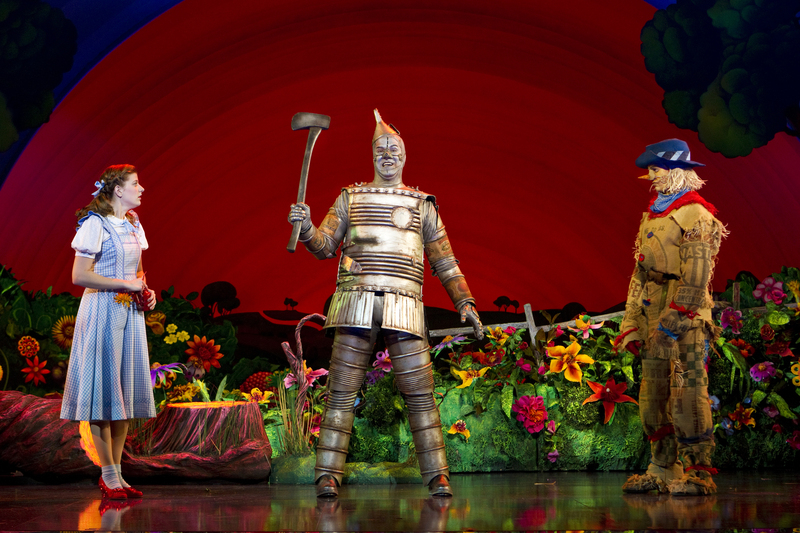 McKnight makes a fine, goofy and forgetful Scarecrow, and Jackson is in great form as a swaggering Tin Man. MacDougall, as the Lion, is funny delivering his many one-liners, although he seems a little too over-the-top at times. The Witches–Willis as a particularly snarky version of Glinda and Donovan as the menacing Wicked Witch–play well in their antagonistic relationship on stage, and Donovan delivers the new “Red Shoes Blues” with gusto. As Professor Marvel (in Kansas) and the Wizard, Brazeau is charming and sympathetic, if not a particularly powerful singer. The ensemble here is strong as well, especially in the dancing. For the most part, I would say that this incarnation of Andrew Lloyd Webber’s The Wizard of Oz is a crowd-pleasing success. While not quite as spectacular as the earlier London production, this version still has many strengths and is an excellent show for families. It’s not exactly like the film, and visually it looks very different, but the story is essentially the same. The poignant and familiar finale (with a slight twist) is especially well-done here, leaving the audience with a sense of wonder and hope.